The amount of K-Cups that have been trashed in landfills could wrap around the planet 10 times. Brewing coffee has changed dramatically over the years. Coffee no longer represents a time to gather with family, take a break, and recharge. Instead it’s about getting caffeinated as quickly and efficiently as possible to do more and more work. This excessive, on-the-go, convenience model of coffee consumption is creating more and more waste -- and big problems for our environment. Nothing is more emblematic of this culture shift and waste problem than Keurig Green Mountain company’s plastic, single serve K-cups. Designed specifically for the Keurig brand coffee brewer, these white plastic pods with aluminum foil lids create a single cup of coffee with the press of a button. After the coffee is brewed, the pod is designed not to be reused, composted, or recycled - but to be thrown in the trash. Keurig Green Mountain company is widely recognized as the pioneer of these single serve pods - but there’s nothing pioneering about trashing the planet with excessive waste! K-Cups may be small in size, but the waste is adding up fast. The amount of K-Cups trashed into landfills as of today could wrap around the planet more than 10 times! More broadly, almost 25% of American homes owned a single cup brewing machine. That’s over 75 million homes brewing single use pods like K-cups everyday, multiple times a day. This means that tens of billions of nonreusable, nonrecyclable plastic pods have ended up in landfills thanks to companies like Keurig - and that number is exponentially growing as more companies join the industry. Keurig Green Mountain Company’s President and CEO Brian Kelley said, “We have to think about sustainability in everything we do.” In response to backlash from consumers about the wastefulness of K-Cups, Keurig says that they have a commitment to make K-Cups out of #5 polypropylene plastic by 2020 so they can be recycled in most areas. While recycling is important, only a mere one third of major recycling programs accept this kind of plastic. The K-Cups that don’t get recycled will take thousands of years to decompose in a landfill and will contribute to our growing problem of plastic pollution. Worst of all, as Keurig tries to live up to its motto to “brew a better world”, their short term environmental solution is to incinerate K-Cups! Through their Grounds to Grow On program they encourage their customers to mail their empty K-Cups back to Keurig where the plastic pods and aluminum tops are burned in energy incinerators. Incinerating trash is known to waste lots of energy and to put harmful, cancer causing toxins into our air, water, and soil. The best way to address these problems is to use existing technology to make K-Cups reusable or compostable instead. We’ve seen this problem before - from microbeads to plastic water bottles to styrofoam cups - and we know better. We won’t let the notion of “convenience” be a marketing scapegoat for billion dollar corporations to trash the planet and get away with it. 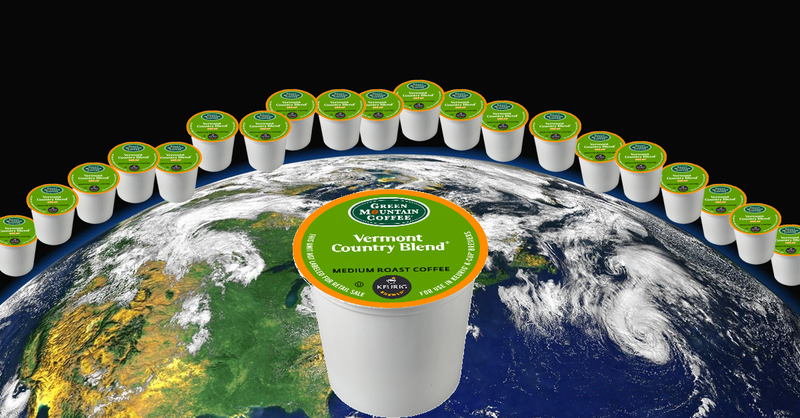 Keurig Green Mountain Company has an obligation to do right by the planet and its people. That means taking responsibility for its products’ waste all the way until the end of their life cycle. Green Mountain should stop greenwashing. One of the first ways they can do that is by making the K-cup reusable and compostable. The practice of brewing and drinking coffee may have changed over the years - and it certainly will change further with time. But one thing that will never change is each generation’s dependence on a healthy planet.